Pressure washers come in a variety of sizes, from the commercial washers with the capability of ejecting large amounts of steam to the smallest DIY units that are electric. Only once have I had access to the big beast with steam, and man was it sweet. On Friday afternoons I would pull my old car down to the bay and 10 minutes later it would emerge smoking and clean, even the grease, grime and oil on the motor were gone. I have also used the other end of the spectrum and wondered why I didn’t just grab a hose with a nozzle and use it. However, the most useful size for homeowners and small commercial operations are the gas powered units with substantial pressure and flow, with a well built pump attached to a solid motor that starts easily. Nothing is worse than trying to turn over a pressure washer once it builds up pressure in its pump. 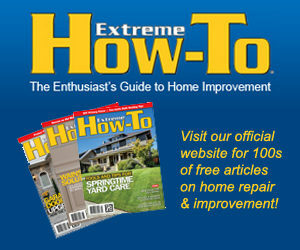 The best way to avoid this is to make sure the engine on the pressure washer is renown for its easy starting. 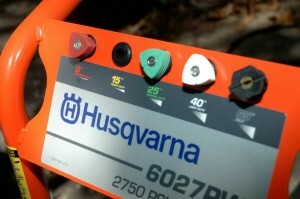 The Husqvarna 6027 PW utilizes Honda Power. When it comes to reliable starting, Honda has established quite a reputation in outdoor power. The Husqvarna 6027 is an outstanding pressure washer for homeowners needing reliability and enough power to handle all but the toughest cleaning tasks. The 6027 comes with a selection of five power tips, ranging from 0 degrees spread to 65 degrees spread for applying cleaners. For deep cleaning I used the 15 degree tip for cleaning tractor engines and for removing rotting wood from siding. The 0 degree tip was great for removing scale and rust from our commercial pier. The 0 degree tip is not to be used on surfaces that are susceptible to damage from the high concentration of water pressure emitted from this, the smallest of the tips. To elaborate I used it on rusted piers and it literally removed the scaling rust and also the surface rust until I saw the black of the metal surface. The 0 degree tip I also used for removing loose paint from painted steel. This proved to be a great time saver, as now the only sanding required would be to feather the layers of paints around the bare metal. No one hates prep work more than I do, but I can say using the Husqvarna 6027 on initial prep on steel was a lot more pleasant than picking steel fibers out of my skin after using a grinder with wire wheels to do the same task last winter. I was surprised at how well the 6027 handled this task. With patience I could work the tip along the edges of paint bubbles, freeing the loose paint and exposing the metal beneath. Once the loose paint and rust were removed I was looking at surfaces ready for application of rust inhibitors or converters. If I were doing more of painting large metal surfaces, I would opt for Husqvarna’s larger pressure washer, either the 9032 0r the 1340. One of the things that makes a handy accessory is an additional hose. Having 25 feet of hose is fine for washing cars, but 50 feet of hose means moving the unit half as much. 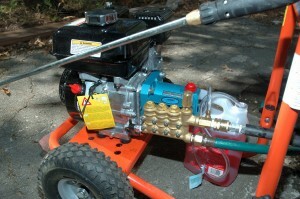 The guts of any pressure washer boils down to two items, quality of the pump and the engine used to power the pump. Kudos to Husqvarna for selecting CAT as its pump provider. CAT’s reputation is well deserved and the pump has an oil observation port which removes any doubt of how much oil the pump has. Dead pumps equal dead pressure washer and knowing the oil level without having to remove the filler cap is a nice touch.